Oh, it was a lazy weekend. The kind where you sleep for the better half of the morning, and the major event of the day is boiling the kettle to make tea. Read a paragraph of some book, then pass out again. Stare out the window. Consider going for a walk; have a nap instead. So far, 2012 has been ram-jammed with all sorts of excitement, and I guess I just need to catch my breath. I seldom slow down enough to let two days pass without doing anything of real “consequence”, but boy when I do, I become the queen of Sloth Ville. Luckily for you, the lazy sometimes leads to crazy-yum kitchen creations. The one thing the sloth queen did accomplish this weekend, was making pancakes. And not just any pancakes, but Banana Bread Pancakes. Hilariously, they started off as a desire to make the Coziest Banana Bread (since it was the coziest of weekends), but I was totally too lazy for that. Having to get out a cutting board and knife? Daunting. I let the food processor do the chopping and mixing. My lethargy led me to making walnut flour, instead of chopping the nuts by hand and leaving them chunky – turns out that was the best idea ever. I have never worked with walnut flour before, but it lends the most delectable nutty taste to the final product, like a walnut whisper wrapped in a warm oat-y hug. And as walnuts are best friends with banana, their complimentary flavours give high-fives all the way from your tongue to your tummy. There’s a lot of love going on in one lazy little pancake. The bonus is, these babies are gluten-free, which can be a nice change from the typical, wheat-centric breakfasts we all gravitate towards. Yes, they contain oats, but if you purchase gluten-free oats you’ll be guaranteed that you are getting a product that is safe even if you are Celiac. Gluten-free diets have become uber-trendy in the past couple years as celebrities have plugged the lifestyle as a savior for their overall health and wellness. But why would someone go gluten free if they didn’t have to? Good question. Does it seem like cool-kid train has left the station heading towards the Promised Land, while you’re still standing on the platform? It’s okay; I think you’re cool. But here’s the low-down on gluten-free eating in case you want to buy a ticket for later. Gluten is the natural protein found in many grains, such as wheat, rye, barley, and spelt. Despite recent uproar and confusion, gluten is not bad for you. Some people however, have an autoimmune form of gluten intolerance known as Celiac disease and cannot digest it. Celiac disease affects nearly 3 million Americans, and those affected must avoid all foods and food products that even come into contact with gluten-containing grains. Short answer, yes. Oats are inherently gluten-free, but are very often grown with or processed in facilities that also handle wheat and/or other gluten-containing grains. Because oats become contaminated with gluten in this way, they are often not safe for Celiacs. However, some companies have developed dedicated processing facilities for oats only, making them safe for those who cannot tolerate any gluten whatsoever. These companies include: Bob’s Red Mill, Cream Hill Estates, GF Harvest, Avena Foods, Legacy Valley (Montana Monster Munchies), and Gifts of Nature. Click here for a discussion on oats in the gluten-free diet or visit Health Canada’s website for an extensive technical review on the safety of oats in the GF diet. Many people who are not affected by Celiac disease are making the switch to a gluten-free diet, claiming that it helps them lose weight, gain energy, improve concentration etc. Of course there can be something to that as we are all very different and react to foods in very different ways – some people find that eliminating gluten, or even just wheat makes them feel dramatically better than they did before. Great! But as we all search in vain for the “miracle diet” that will make us feel amazing, look our best, and allow us to take over the world, we must remember that there isn’t one right answer. We have to take time to listen to ourselves, and give our own bodies a real chance to tell us what is best for us. Even if your best friend gives up gluten and feels incredible, it may not necessarily be the right choice for you. Often the reason many people do shed a few pounds and generally ‘feel better’ eating foods without gluten, is not the avoidance of gluten itself, but the fact that they are making healthier food choices. We all know what happens when we polish off the breadbasket at lunch; we feel sluggish, foggy, tired and often bloated. It’s not a coincidence – what do you think will happen when you down a loaf of white flour? Conversely, when you choose a gluten-free diet, your horizons are forced to expand just a little, and suddenly quinoa, amaranth, and millet make their way into your dinner. You choose fruits and veggie snacks instead of cookies and crackers. Breakfast becomes smoothies instead of cereal. Variety comes into play, and that is what makes the difference! More freshness! More produce! Less dead, nutrition-less, life-sucking white bread. Just sayin’. But let me be clear about another thing: wheat is not the enemy! Whole wheat is good for you. So are rye, and barley, and spelt and kamut. These grains contain gluten, yes, and are also full of protein, fiber, phytochemicals, B vitamins, folate, calcium, selenium, iron, and zinc. When prepared properly and eaten in their whole, unprocessed forms, they have many benefits. The problem is many of us eat wheat three times a day, often in its over-processed forms (boxed cereal, sandwich bread, pasta…), which has been stripped of most of its valuable nutrition. It’s not necessarily the wheat, it’s the way we process and consume it. If you want to give gluten-free eating a shot, go ahead. Perhaps you do have an insensitivity lurking around, and eliminating gluten will certainly shed some light on it. Or, perhaps you want to cut back on the wheat and introduce new and exciting foods to your diet; experiment with the amazingly diverse seeds, nuts, and grains that are on the market for you to explore. Sometimes imposing a few limitations on oneself forces creativity, which can be a very good thing when it comes to what we eat. PB&J sandwich again? We can do better than that! Why do I create gluten-free recipes on My New Roots? For the same reason I try to make as many of the dishes vegan, sugar-free, soy-free etc. – so that everyone can make them. I want to create all-inclusive meals that all people can enjoy, even if they’ve chosen a particular diet or they have some kind of allergy or insensitivity. And I feel it’s important for others to know that eating with ‘restrictions’ is not all that restrictive. Besides, you have that raw lacto-vegetarian coming over for dinner next week and you need something yummy to serve them, right? I shall deliver. 1. In a food processor, pulse walnuts until they resemble a sand-textured powder (do not over process – you’ll end up with walnut butter!). Remove walnut ‘flour’, add oats and pulse until you get a shaggy flour. Place walnut and oats flours in a large bowl. Add baking soda, sea salt and stir to combine. 2. Add all wet ingredients to the food processor and blend to combine. 3. Add wet ingredients to dry ingredients and mix just until the two come together. Let batter sit for 30 minutes at room temperature. 4. Heat a little coconut oil (or ghee) in a skillet and drop in 3 large spoonfuls of batter (you are after three, 8 cm / 3 inch sized pancakes). Spread slightly with the back of the spoon to even out the batter. Turn heat down to low. Let cook on the underside until the topside is opaque, which will take more time than a regular pancake. Check to see if the bottom has browned, and if so, flip over to cook the other side. Cook until the underside is crispy and brown (although the middle is a little moist, this is okay). 5. Put pancake on a baking sheet in a warm oven, and cover with some foil while you make more (this will also give them time to firm up a little in the middle). 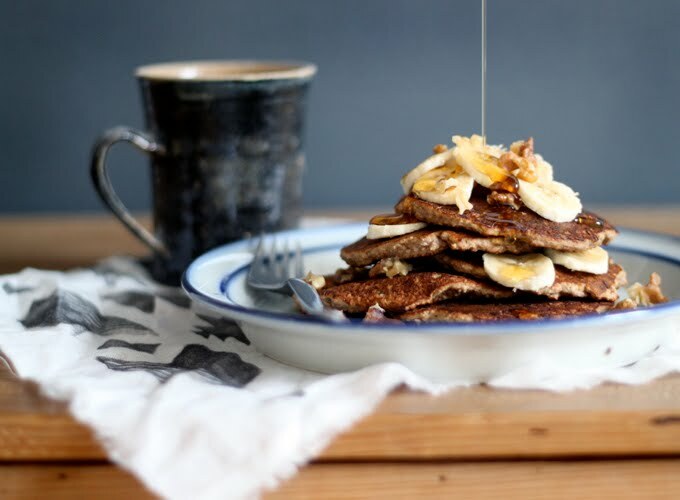 Serve with pure maple syrup, fresh banana slices, chopped walnuts, and grated dark chocolate for a special treat – they are banana bread pancakes after all. If anyone wants to get lazy next weekend and make up a batch, feel free to experiment and get back to me with results. I love hearing what you do to change up and even improve my recipes! 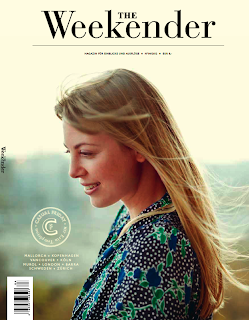 The Weekender Magazine – I somehow made it on cover. Nuttiness. Yes, I am on Twitter now. You can follow me and stuff. We love the pancakes so much we make them once a week! Do you think there’s a way to make these into muffins? I make these twice a week for my kids for breakfast, lunch, snacks. They love them. I hope you get inspired to make more recipes like this that require no sugar and are so easy to make! Thank you for creating these, it’s changed our lives! these were amazingly delicious! my 14 month old and i devoured the whole batch and up until now he has not been a fan of any kind of pancake. these will definitely become a go-to in our house! Even though oats are glutenfree, does anyone know why when some of us eat organic oats, it causes sinus congestion? Thank you so much for your explanation about gluten. I was already about to ask if it was bad for the body. I didn’t manage to find any detailed information on this point. Hi there! I really hope you’ll answer this question because it has been bothering me for quite a while and I can’t seem to find a reasonably answer on da web. Why use rolled oats when you’re gonna make a flour out of it anyway? Why not steel cut? Or instant? Does it matter? And for the recipe: Gonna make this tomorrow for me and my mum! So excited 🙂 I’ll probably won’t get an answer in time, but…. What do you mean with a shaggy flour? Just a note on Gluten free oats. Great if you do not have Coeliac disease. However it is not advised for people with Coelic disease due to the protein in it. Even if someone with Coeliac does not react adversely to gf oats caution is advised as you could be doing hidden damage that will only picked up much later via a biopsy. This data had been modified quite some time ago. It is noted that in rare instances some people with celiac dx may have the same reaction as they would toward barley, rye and wheat, but it’s a Rare reaction not a very common one. An adult with Celiac disease is allowed 1/2-3/4 cup of pure oats a day (certified gluten free) and children it’s a 1/4 cup according to the celiac association. So Quaker Oats may be not be the best idea but if you are dealing with a product that is certified gluten only the very rare few will have an idiopathic (or I known) reaction to them. Wao so sweet and delicious. Thanks for sharing. Really I like it. Hay so nice work well done thank you. wow! it looks very tasty i also try this one yummy i cant wait i am going to try this …..
Sarah for these good tips on gluten-free choices. I am not celiac and I eat wheat and other grains containing gluten in their whole form as much as possible. In the morning, home-made muesli with rolled whole spelt or oat or a mix of the two. Lunches can have some more whole grains in the form of salad, or in a home-made bread. At night, same, maybe a small piece of home-made whole grain flour bread along with my meal. is that too much gluten, or what matters is the whole form of the grains we eat, and the portions? Thanks for your help. These pancakes look very delicious and I’ll make them next week, for sure! I already made your banana bread adding millet and published it, it’s very very good, my favorite banana bread recipe! Hi – I tried to make these last weekend, but substituted Almond flour because I had no walnuts – they were delicious but a disaster to cook. Any suggestions if using almond flour or should I just follow your directions to the T? Pingback: » 9 Delicious and Nutritious Banana Bread Recipes – National Banana Bread Day! I made your pancake today for myself and a friend…..put them on the griddle and they cook up very nicely….they were Delightful and Amazing!!!! I can’t wait to get your cookbook. Thank you for a wonderful recipe! I look forward to enjoying more of your recipes. This is random, but can a pancake recipe be used to make waffles? Usually yes, but I haven’t tried it with this recipe. Let me know how it goes! Pingback: 12 Energy-Boosting Snacks – So Easy to Prepare Under 15 Minutes! sooo good. i used hazelnuts instead of walnuts (and added a little cornflour) – delish! I just made these and they came out great. The recipe is a bit like a porridge. Perhaps it’s the pan that you’re using? Make sure the pan is hot enough (not smoking though) so that when you pour on the mixture in it sizzles. Smaller size pancakes are easier. Sarah said hers were 3″. I could image a typical sized pancake being to big and mushy to flip here. Wait until they’re fully brown on the bottom before flipping over. Once flipped, you can press down on them a bit with the spatula to make them thinner. i tried twice to cook this batter, after 30mn and the day after. A total disaster. The first time the batter wasn’t thick enough and the three pancakes became a big one impossible to flip. I ended up scrambling it into a porridge. The second time they kept their shape but were still impossible to flip because the bottom burned before the top was firm enough. I scrambled it again to avoid a total waste. Disappointed, discouraged. My first recipe from the app. ? Help !!! Finding your blog has truly been a revelation for me! Unfortunately I have many food sensitivities (gluten, xanthan gum, etc.) and many of your recipes have brought me such joy! Thank you so much for sharing your genius! oh my good!!! love this recipe!!! i’ll try this tomorrow. Umm…wow. These are seriously delicious–I almost licked my plate! I actually don’t like pancakes–and I would eat these every week. I sprinkled a tiny bit of himalayan sea salt at the end–over the syrup, sliced bananas and walnut garnish. They also smelled heavenly while I was cooking them. I was skeptical because the batter was sort of runny–so def let them sit for 1/2 hour–but they cooked perfectly. I don’t know what it is about your recipes–they are so easy and full of real flavors. My favorite recipe based blog by far. I’ve told all my friends about it…I would love all these recipes in a book–any plans for one? ps…agree with Katie above…be patient while these cook…not like a typical pancake that fluffs up and is ready to turn in 30 seconds. I let them set on the griddle for about 6-7 minutes at 325–and then they turned over perfectly–almost crunch to the crust and a warm, rich brown color. I almost took a picture–but ate them too fast. haha. Made these again this morning. A great way to bring in a Friday and jump-start the weekend. 😉 And people should know your directions to cook low and slow are really not a mere suggestion, as the pancakes will not bind before flipping otherwise. Patience here! thank you for the articulate discussion of gluten free as a fad diet vs. gluten free as a medical necessity. as a celiac i am torn between appreciating that the attention to gf has garnered a huge increase in gf recipes and products — and resenting the insults and skepticism from all the ignorant critics, chefs and even doctors who think gf is just a crazy diet. the other problem is that as with all “special diet” recipes and products. the answer is all too often to compensate by increasing fat, chemicals and especially sugar. As a vegan who dislikes sweets and avoids processed foods, I am always looking for cooks like you who approach gf from a whole foods perspective. I have been digging through your blog for days because I appreciate your science-based approach — there are many good inspirational, popular magazine-style healthy food bloggers, lots of DIET MY WAY writers with little or questionable scientific backing, but I want research and pragmatism with great recipes! they were too wet for me.. wouldn’t form into a pancake.. not sure why. I love pancakes mummy exclaimed master 3 with glee! Once I got the hang of spreading these out nice and thin these worked awesome! These were amazing!!!!!! I just made them for breakfast….my 1 year old, 3 year old, and Mom who follows a strict anti-inflammation diet….loved by all!!! So happy to have found your blog! Delish!!! My piterest page is full of my new roots recipes! I love the way you explain things!!! I find it really easy to understand as well as interesting! I have some of your granola in the oven as we speak, made the raw brownie last night (yum!! ), and am now on my way to purchase the ingredients for these divine pancakes!! Thank you!!! I tried these babies this morning with Almonds, Coconut milk & topped with Pineapple. A new favorite, thank you!! I made these twice because my husband and I really enjoyed them! I slightly tweaked the recipe the second time and had better results (easier to flip!). I let the batter sit for about 2 hours, I added some chia and ground flax seeds, used 1/2 tsp of baking soda (I could taste it when I used 1t), and didn’t have almond milk so used water the second time (didn’t notice any difference). With some maple syrup, fruit compte and walnuts these pancakes are divine! This is a great post (and great pancakes). I’m currently supposed to eat gluten free because I am on an anti inflammatory diet and am trying to eliminate poor digestion and eczema, and am glad I read that information about the oats- I was about to pick up the old oats from my kitchen! You make a wonderful point about the fact that wheat isn’t evil and how people should not ‘hop on the gluten free band wagon’ without good reason. I, as I am sure many people do, have friends who are actually intolerant of gluten and so the gluten free diet is a must for them. It is important to realize that people eat different ways for their own bodies and that one diet does not fit all. I wish everyone had such a refreshing approach to this topic as you did, rather than writing posts which slam certain ingredients or eschew others for reasons that are obviously not based out of health. Like you, I like to experiment with different ingredients and am finding that, while on this special diet, I am indeed discovering foods I might not have considered before. Your approach only proves that we need to constantly evaluate what we read, do our research, and make the choices that are right for our own bodies without comparing them to others. O melhor mobiliario para a casa. Since I have gone gluten free for almost 2 full weeks I’m having less joint pain and my rings come off easier and I’m experiencing weightloss … I’m not sure if its less gluten or chemicals in the food , regardless I’m happy ! Made these last night for “Fat Tuesday” and WOW! just WOW! the best pancakes EVER!!! Used buttermilk instead of nut milk YUMMMMMMM!!!! Can’t wait to try these! My only concern is the oats – I do not do well with them – even gluten free ones. Any suggestions on gluten free flours that would replace nicely? Thank you! You have a beautiful blog….I love it….gluten free is new lifestyle that we have embarked on as my daughter was diagnosed with Celiac’s. However I’m beginning to find some amazing recipes. While I love pancakes – going gluten free has been a lifesaver for me. I am not diagnosed Celiac. Eliminating wheat has made huge changes in how I feel – I did wheat testing – before going totally wheat free – and found I did react to it negatively. I don’t think going gluten/wheat free is a “fad diet” — It is however, a life choice – and one that I advocate trying. If it doesn’t work out then it’s a choice to eat the wheat again. I agree about eating healthier by making educated choices about what we do eat – whole natural foods are always a better choice. Not sure how much this holds true – but from what I understand you can not eat wheat without some processing and that any raw wheat flour has the potential to make you sick. Something to think about. Just ran across this recipe because it looks amazing! While I’m dying to try them, I’m mostly smiling at your great take on “gluten-free”. While I wholeheartedly believe some (even non-celiac) just don’t do well with it, I think for many it’s yet another diet fad. Your comments about it being the overall change in diet that makes a big difference is absolutely spot on. When you go GF you’re likely thinking healthy anyway, and are going to choose even more healthy choices = better for your body. Can’t wait to make these pancakes! This recipe caught my eye last week, made them today… Enjoyed them warm out of the pan, but Loved (yes, capital L) eating them cold later on! The subtle sweetness really popped out, which is dangerous because I definitely are more than I was hungry for (they’re just so tasty)! Thanks for the recipe! Love your blog, your recipes, photos. It’s all inspirational. I’m not sure if anyone has commented on this yet, but according to contradictory advice from Coeliac Australia oats are not safe for consumption by Coeliacs due to the Avenin protein (naturally found in oats). This is present even if the oats have not been contaminated with other grains. I found your website via the above mentioned blog. I’ll definitely try those! I just wrote a post about eating gluten free. I have been diagnosed with celiac disease but have been off a gluten free diet for years. Thanks for posting this! Wow, my best friend just made these for me for breakfast and they are completely fantastic. I will be linking this on my blog in the coming week! Thanks so much for this wonderful recipe. Deeeelish! I have to admit I used almond flour instead and also added an egg to the mix. They were so tasty and even better the next day! I made your banana-bread-pancakes before, but improvised while vacationing on the island of Maui. Substituted macadamia nuts and apple bananas and skipped the maple syrup. They were a hit with my family. Looking through this post makes me want to go home, go be Aunt Jemima and whip up these fab pancakes! I just found this site. It looks so good. This was the first recipe I tried and mine did not work. Total bummer! The batter is too good to waste so I may try to add it to a banana bread recipe or something. These were the first gluten free pancakes I have ever made, and they exceeded my expectations! They were incredibly easy and soooo delicious. Served with grated dark chocolate and maple syrup, they were amazing. I love that they don’t make me want to go back to sleep after eating them. Mmmm. Thanks so much for exposing the truth about gluten. I wondered what all the gluten-free hoopla was about. I like your assessment that gluten (and whole wheat) isn’t all bad, but going gluten-free opens you up to experiment with other healthy options. You’re a great writer with delicious-sounding/looking recipes. I will definitely keep coming back for more. I made these pancakes this morning but exchanged the maple syrup with maple agave. They were absolutely perfect. Wow. Wonderful recipe. I’m so happy to have found your blog and cannot wait to make more of your recipes. I made these last night for dessert at my parent’s house – they were incredible! I love everything about them – texture, colour, flavour, but best of all they’re so healthy and delicious! To make it a bit more luxurious for dessert, I caramelised some bananas in a little bit of maple syrup and demerera sugar – yum! Thanks for an awesome post and recipe! I’ll be making these again and again and again. I was introduced to your blog from a recipe my friend posted on Piterest. I’m now kinda obsessed with your blog. I would love to eat in your kitchen. I just made these pancakes and AMAZING! I to am in the Holistic Nutrition world and I will be looking to your blog as further education. Good job! I like it when good cooks make recipes that are suitable for “special diets” even though they don’t have to follow them. Yotam Ottolenghi has become a vegetarian hero here in the UK, without actually being a vegetarian. Your pancakes look good and I’m intrigued by their flourlessness… For Pancake Day I prefer the thin kind – I’ve just blogged my very simple gluten- and dairy-free recipe. But I might be trying yours when I can make them in my parents’ kitchen (no food processor here)! I have been LIVING on these! Our house is gluten free and vegan with combined allergies and these pancakes please everyone. They reheat great, too! Yum!! Dear friends, thank you for all of your suggestions on how to make these work for you! It’s funny, mine turned out really well, but you never know how ingredients will act in different parts of the world! To Tania – gReAT iDeA! I will try that next time too, although I liked the thickness of mine. I was making variations of these pancakes for a while now. Cause I love giving them to my son. In my experience adding chia seeds previously soaked in water for 10 minutes helps a lot to keep the batter together. It also makes them come out not so thin! I had a go at these pancakes and need some advice to get them just a pukka as yours! I can’t get almond flour on my small island in the Med, so what would you suggest as substitute – buckwheat? I also found my food processor didn’t quite chop the walnuts enough, so would substituting those with already ground almonds work? I loved them, but just need to work out how to perfect them! Such a great breakfast for setting my son up for a school day! thanks. Great details indeed. I’m right here to see some good comments! I was so excited to make these and I am disappointed to say they didn’t turn out! The batter was thin and I let it sit for 30 min. like the instructions said..but it still didn’t help. When cooking I put it on low heat and the bottoms became brown but I couldn’t flip them-too thin. Any suggestions because the batter is too good to waste! Just made these and they are delicious, unfortunately, I have inherited my father’s wheat intolerance, and although I can eat, a little wheat I know in my heart of hearts wheat-free is best for me. Mine looked nothing like yours hopefully next try will be more glamorous. Thanks for taking time to blog so generously. sarah, do you think that the batter could be made the night before? i imagine it might discolor a bit with the bananas, but if anything that would just give more time for the moisture to soak into the oats. thoughts? 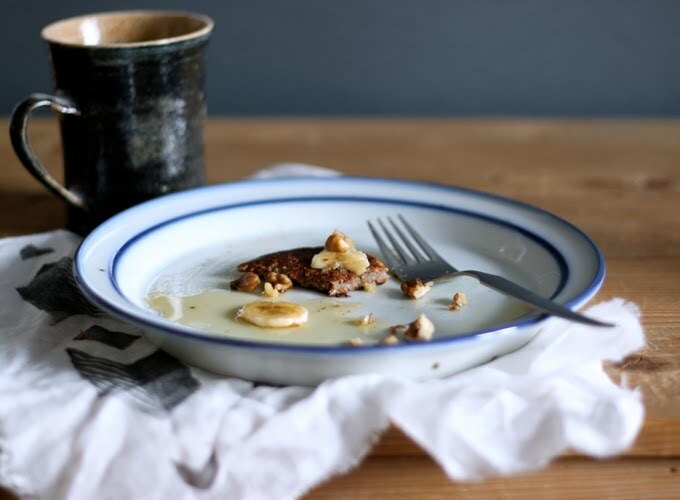 Intriguing recipe, I love the idea of combining walnut flour, oats, and bananas. Your photos are amazing!! Well I was going to talk about those amazing pancakes but instead I’m going to talk about HOW GORGEOUS THAT PICTURE IS. Hot stuff, ladypants. Hot stuff. Wow they look and sound heavenly!! Dear Sarah, I am a huge fan of your blog and enjoy many of your delicious recipes on a regular basis, but I must politely differ with your view that grains are fundamentally healthy. While I appreciate your balanced and smart approach to grains, gluten (especially in the quantities it is found in our modern-day grains) is actually detrimental to our health. I was able to completely cure myself of ulcerative colitis by following a strict gluten free-grain free diet. A lot of new research shows that many medical problems are associated with what is known as non-celiac-gluten-sensitivity and that these problems are completely cured by going gluten free. I HIGHLY recommend the books Wheat Belly by Dr. William Davis and the Paleo Solution by Robb Wolf for anyone interested in learning more about this topic. While I normally stay clear of fad diets and celebrity endorsements, I think this time a lot of people are onto something truly important. My parents don’t eat any type of grains and when I was in town last my step mom made me pancakes with almond flour and I was shocked at how delicious they were. But walnut flour might be even more delicious, I’ll have to try it. beautiful photo of you on the cover! I came here this morning for lazy weekend inspiration and low and behold, my wish was granted. I also blogged something on the subject earlier [well, last night actually], which I must say has freaked me out a little. I went for a Vegan Fry-up: Italian style. Equally lazy, but savoury. These however, look absolutely beautiful. Definitely more in touch with my sweet tooth. I’ll be trying them tomorrow and will let you know how they go. Tres excited. I LOVE pancakes. But hate gluten. Lovely front cover too on The Weekender. I was reading your travel tips and was wondering what you do with the oil of oregano. I know my grandfather is loyal to it too (as he is to bee pollen), but I would love to hear how you use it. And another stunning recipe! You make lazy breakfasts even more healthy and delicious (while still being lazy). I can’t wait to try these, I never thought of making my own walnut flour before! Wheat and I don’t always agree, but I LOVE pancakes. This recipe is a great alternative. They taste just as good as they look (I swapped the walnut flour for almond meal, and they turned out fine). These look delicious! And thank you for the post about GF. I started the GF diet a few days ago because I have a thyroid problem, and my endocrinologist and nutritionist think it will be beneficial especially when it comes to the absortion of my medication. We’ll see. But in the meantime, I will bookmark this as a breakfast option since I am new to the GF world. Yaaaaaaaaaaaaaay! I’ve been thinking, waiting, pondering about PANCAKES the latest week. And I’ve been wondering, wondering how to compose some really delicious pancakes without sugar and wheat and egg and all that stuff that my stomach can’t handle. But now! I’m looking forward to try another recipe from you! HA! Great question…um, I was too lazy that day…but normally, yes! The only thing is, you’ll have to dehydrate them after, before grinding them. Kind of a process, but it’s a good idea! Look amazing – I’m trying this out this weekend. Question – did you use soaked nuts to make this? These look divine. As always, I love all the tidbits and information you share about each recipe. I need these in my life!! 🙂 Bananas, walnuts, and syrup! Yes! I will definitely make them at the weekend. These pancakes look awesome. I have some friends that are gluten free so they would work perfectly. sarah – these look so amazing. your photos are just lovely. from someone who avoids gluten, thank you so much for your blog and for providing ideas and recipes that are delicious and appeal to everyone. i’m continually inspired. xo..
I’ve just found you and love your philosophy so much! I did a detox last May with a nutritionist and have been trying to stay gluten free because it worked for me. You are a godsend! Thank you!!! Sarah, I couldn’t agree more with your eloquent post about going gluten-free. You’re totally right, one diet isn’t for all. Oh and I’m not a pancake person, but these little beauties might just change my mind 🙂 Walnut flour has been on my list of things to try! 2.I don’t even really like bananas all that much, but I swear these are the BEST pancakes I’ve EVER eaten! I often incorporate walnut flour into baked goods, and I love the flavor and texture it imparts. 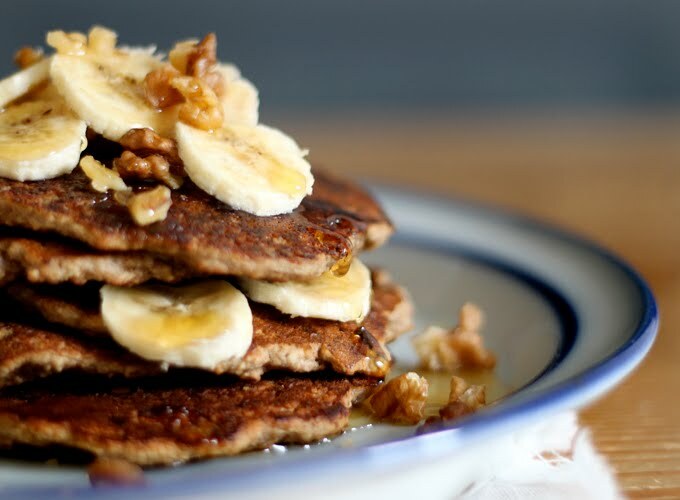 We’ve been on a banana pancake kick in our house, and I can’t wait to give these a try. These pancakes look interesting. A little thinner and crispier. Can’t wait to try! I did an elimination diet last year to figure out if soy, dairy or gluten were giving me digestive problems. [Looking 3 months preggo at the end of every night] I was a very healthy + clean eater, but after eliminating the foods and slowly bringing them back in one at a time, I found gluten to be 100% of the problem. The only gluten product I can eat with no issues, is beer…so “drink” I guess. 😉 I’ve been tested negatively for celiac, and have been off gluten for 1 full year now and 90-95% of my bloating issues have completely vanished! Didn’t lose any weight when I cut it out, but man am I feeling better now. I definitely agree that people seem to be cutting it out of their diets for no real reason, but for me it was a lifesaver! So much relief! 🙂 Another great post!! Thank you SO MUCH for this post! I was so confused about this entire gluten topic, if it is good or bad for us or if it is just a trend, and googling it and doing some research didn´t really help, it even led to more confusion. By the way: I´m also doing the detox but only because it appeared on your blog – otherwise I would have most probably missed it. Hi Valeria – you got it right! It’s not the gluten, it’s the way we eat the grains themselves. Ideally, they should be in their whole form as often as possible, and if in bread, as whole-grain flour. Sounds like you are making smart choices for yourself, keep it up! These look delicious, I never would have thought to make and use walnut flour! I think gluten-lovers and gluten-free eaters alike can rally around walnut flour. And I very much enjoyed reading your view on the gluten debate. It’s become way to fashiony to consider grains as no-no. Thanks Sarah for these good tips on gluten-free choices. I am not celiac and I eat wheat and other grains containing gluten in their whole form as much as possible. In the morning, home-made muesli with rolled whole spelt or oat or a mix of the two. Lunches can have some more whole grains in the form of salad, or in a home-made bread. At night, same, maybe a small piece of home-made whole grain flour bread along with my meal. is that too much gluten, or what matters is the whole form of the grains we eat, and the portions? Thanks for your help. These pancakes look very delicious and I’ll make them next week, for sure! I already made your banana bread adding millet and published it, it’s very very good, my favorite banana bread recipe! Thanks for all the info on gluten-free eating. Loved reading your take on the whole gluten debate – I think you are spot on! They look amazing! Will try this weekend. Cosiest Banana Bread is my new favourite baking recipe (it’s been abbreviated to just hygge in our house), so can’t wait to try these! On your lazy days you chef this up! Your amazing! “Variety comes to play” – So great, Sarah!